I'm a voracious podcast listener in the car. The Android Music Player left several things to be desired. 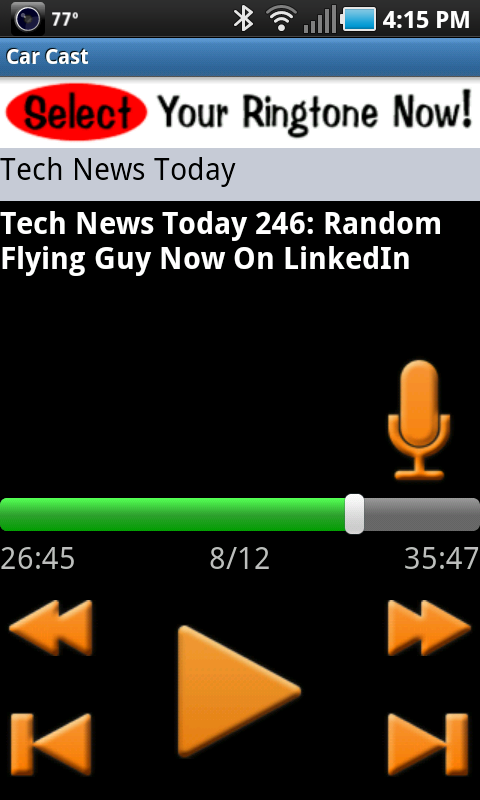 An Android Market search turned up Car Cast Podcast Player. Once launched go to Settings and adjust as you need. I set it to automatically download, to require Wi-Fi to download, to automatically play the next podcast, uncheck to allow data collection and to keep your e-mail address secret (just off the bottom of this screen capture). 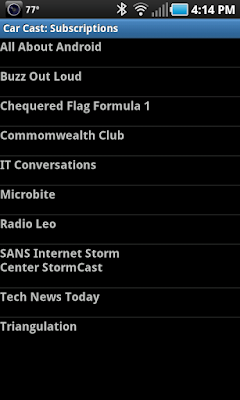 The Subscriptions screen allows you to enter your podcast feeds. After you enter them you can even test the url. 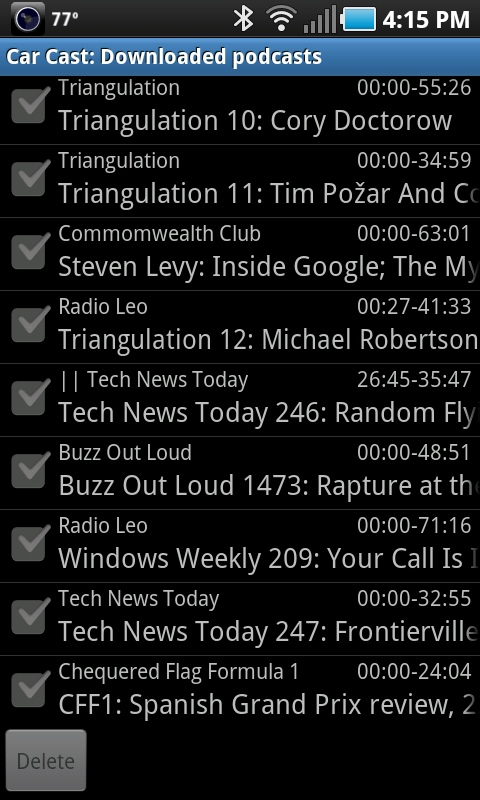 The Podcast screen shows your list of podcasts and lets you select a set of podcasts to delete. Car Cast will even highlight the ones you've already listened to and let you delete them with one click. 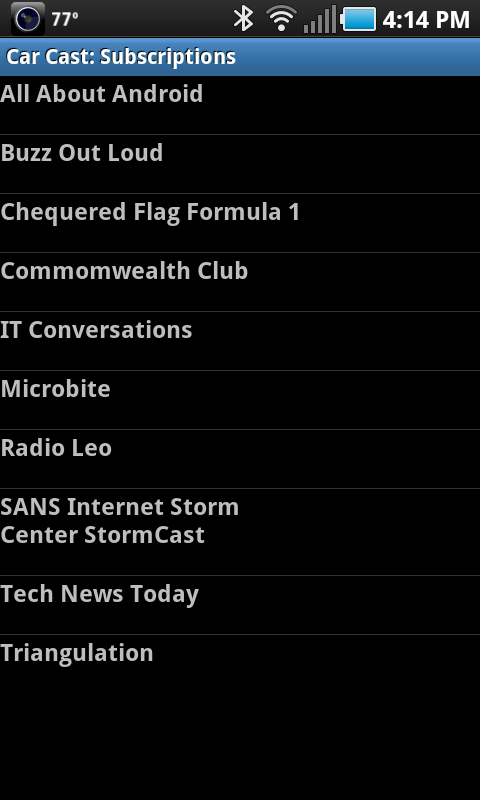 From this screen you can also select which podcast you want to listen to by single clicking it. The main screen gives you BIG buttons. The << and >> buttons jump 30 seconds backwards or forward. The |< and >| buttons skip backwards and forwards through podcasts. You can even drag the marker along the time line. The microphone button will let you make quick audio notes while you're driving. There's also a paid version that lags a little behind the free version to improve stability. I'm playing with this app for the first time, and have one big stumbling block. It seems the only way to enter subscriptions is through the keyboard! My subscriptions have complicated URLs with strings of digits, capital and lowercase letters, and special symbols. There's no way I'm going to try typing all that through the keyboard. Hopefully I'm just being dumb (happens a LOT), but without a way of importing subscriptions, this app isn't very useful. What I've done to address is to use my laptop to create a draft e-mail in my Gmail containing the URLs for the podcasts. I can copy and paste into the e-mail. Then save it to draft. 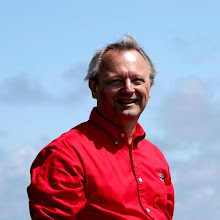 I move over to my Android handset and open the draft e-mail in my Gmail app. Then copy and paste each URL from the draft e-mail to the Car Cast subscription screen. 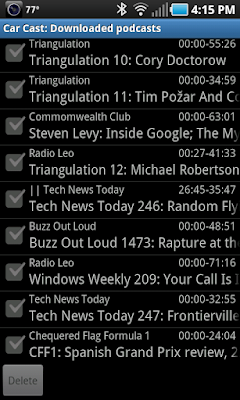 The other technique I've developed is how to move my set of Car Cast subscriptions from one Android device to another. Using a file manager I go into SD Card/carcast and send podcasts.properties to Dropbox. Then on the new device, I install Car Cast and export this file to the same location.